Abbotsford/Chilliwack – University of the Fraser Valley soccer players Tristan Corneil and Tammer Byrne have been named Canada West all-stars. The conference first and second all-star teams each feature five defensive players, five offensive players and a goalkeeper, and are voted on by the head coaches. Corneil, a fourth-year right back with the Cascades women’s squad, was voted a first team all-star as a defensive player. The Cloverdale, B.C. product registered two goals and an assist during the 2015 regular season, highlighted by the game-winning goal against Thompson Rivers on Sept. 18, and also made strong defensive contributions. 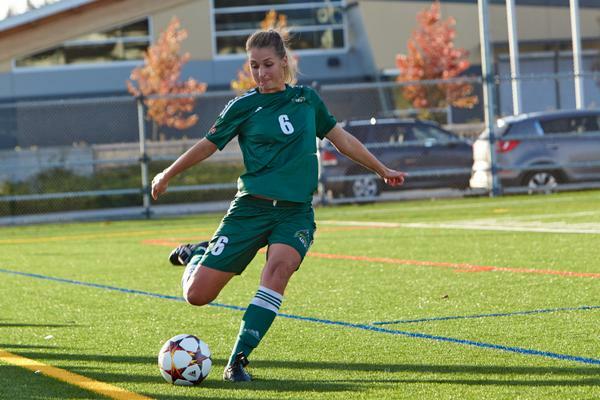 Corneil becomes the second UFV women’s soccer player to earn Canada West first team honours, joining Kara Delwo (2014). Byrne, a sophomore from Abbotsford, was voted a second team all-star as a defensive player. He was UFV’s male rookie of the year across all sports in 2014, and showcased his versatility in his second year, lining up as a centre back or centre midfielder depending on his team’s needs in a given game. According to head coach Tom Lowndes, Byrne played a key role in keeping the Cascades organized defensively. Byrne and the Cascades men’s soccer team are at the Canada West Final Four this weekend. They take on the tournament host UBC Thunderbirds on Friday in the semifinals (7:30 p.m., Thunderbird Stadium), with the winner earning a berth to CIS nationals. On Saturday, the Canada West bronze medal game goes at 5 p.m. followed by the gold medal game at 7:30 p.m. All games can be viewed online at canadawest.tv (pay per view). Be the first to comment on "Two UFV Cascades Soccer All Stars"